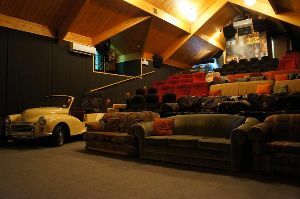 This 3 screen classic movie theatre located in Wanaka, New Zealand is a real find. The cinema boasts comfortable old sofas, an old Morris Minor, a café and bar serving delicious meals before, during or after the movie. Homemade ice cream, world-famous hot cookies fresh every intermission and a warm welcome from the friendly staff. Loads of travel guides list the cinema as a “must do” and it is truly a memorable movie experience! In 2015 we also received a Certificate of Excellence from TripAdvisor and ranked number 1 in Wanaka. But don’t believe us, read some of our reviews or come see for yourself. For bookings and general enquiries please phone the cinema.